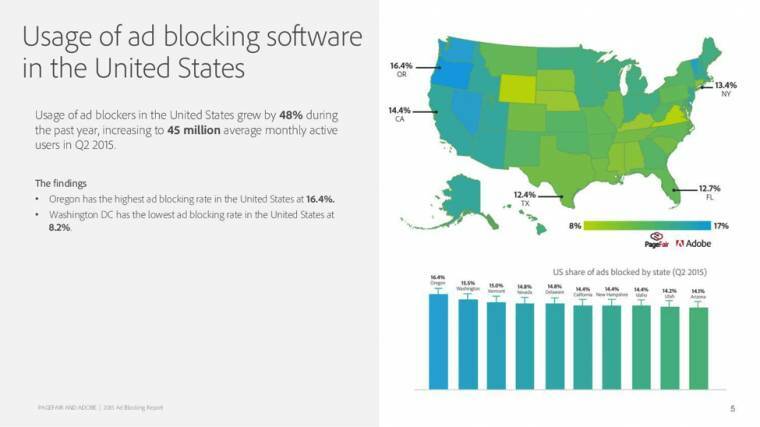 Global Web Index and AdBlock Plus has released a report on the behaviour of Internet users in the USA regarding adblocking. Unlike the prevalent opinion that users block ads because they do not want to engage with intrusive advertisements, the report states that most of the users want to avoid advertisements served to them. There is a thin line of difference between reluctance to engage with ads and ad avoidance. Prominent experts argue that it is not advertisement aversion which demotivates the users, rather it is the user experience (data usage and page speed) which becomes the buzz killer. The report surveyed 1000 US-based Internet users. Among the respondents, 40 percent of them admitted to installing and using an ad blocking software in the past one month and to a considerable extent, the ads were blocked on desktop computers and laptops. Again, out of the 40 percent people using ad blockers, 22 percent of them blocked ads on mobile devices. Compared to the USA, Page Fair says that mobile ad blocking adopting in Asia is higher. The reason for the lesser adoption of ad blocking services on mobile devices is due to unawareness. Respondents below 35 years of age were more aware of the mobile ad blocking possibility, with the 16-24 age bracket as the “most aware” segment. The report further reveals that between the genders, 58% men are inclined to block ads. If the experts are to be believed, page loading times and data speed play a significant role in ad blocking metrics. Perhaps, this is the reason Google introduced AMP for ads, which would help companies to get a better response from the ads displayed in the AMP mode. The AdBlock Plus survey says that page loading time and data speed play minor roles as 47% of the smartphone users clicked on the “I would prefer to block all ads completely on my mobile choice” option. The mobile users are particularly averse to interstitial ads as it disrupts the mobile content consumption. A generic aversion towards ads is not new. These statistics reinforce a trend among Internet users, limited to the USA though, and without careful consideration and innovation of new ad deliverable models, it might become tough for advertisers to reap substantial ROI from ad-based marketing pipeline.